This is a new waterfall painting by Artist David Miller. 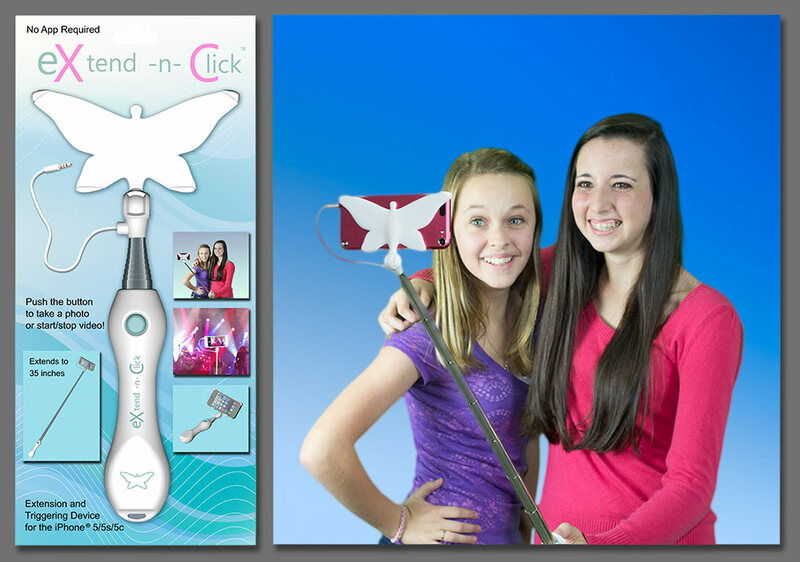 My invention, the Extend-n-Click is ready for production! I can’t wait to get this to the market. I’m already receiving pent up demand for this product! What really excites me about this project is that its a complete departure from my day to day activities as an artist. I’ve been keeping an eye on the market and I haven’t found anything that looks even close to as cool as the Extend-n-Click. 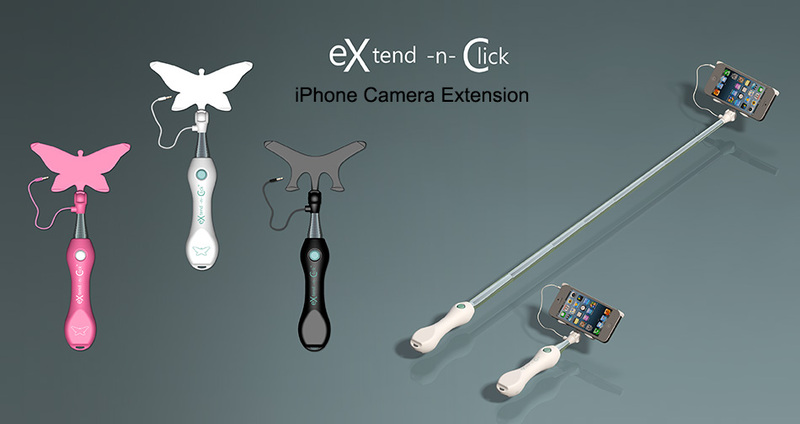 This iPhone 5 camera extension will be a very useful and fun product. People who want to take selfies with their smartphone now have the perfect companion accessory to their iPhone. This is THE iPhone camera extension to have because it comes in three colors and has two styles of camera holders. It is perfect as a stocking stuffer, or a gift anytime! Just plug in your iPhone and extend the stainless steel extension rod up to 35″ from your reach. You’ll be amazed at the pictures and video you can capture with this one of a kind idea! I decided to get the ball rolling and let the cat out of the bag on my latest invention. I realize you might be confused right now since I’m a painter by trade, but my first experience in life – really starting as a boy – was in electrical engineering. I was creating circuits with Radio Shack parts when I was still in the single digits. I went on to work for a semiconductor company creating illustrations for all sorts of interesting technology. That’s why I’m still facinated by the amazing technology that continues to flood the market. While at Disney World in Orlando, FL. last summer, there was a high school cheerleading competition going on. You can imagine how many tiny girls were running around taking selfies with large groups of their closest friends. You can also imagine how extremely limited they were with their tiny arms and the distance they could reach. Got me thinking about the popularity of iPhones and the interest in self portraiture. I had an idea that had to come to market! I just completed a new original painting and sent it down to the Adam Scott Rote Gallery (ASRG) in Key West. 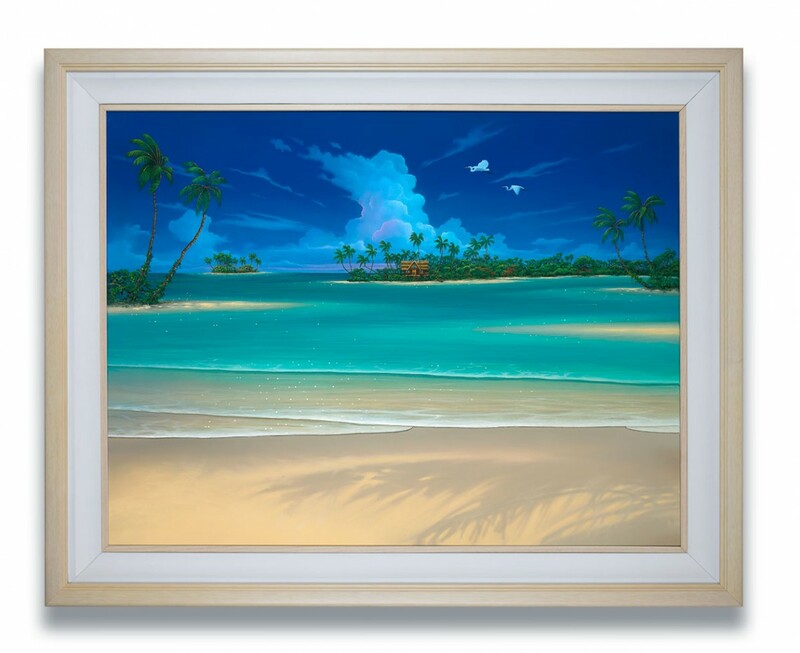 This piece is very typical of my tropical seascape paintings and reflects the ambiance of the local beaches here in SouthWest Florida where I live. Last year, Siesta Key was the beach that was chosen by Dr. Beach as the best in the U.S. This is only about 30 minutes from my home and has been the inspiration for another original painting that was commissioned by long time collectors of my paintings. I was just out at Santa Maria Island off Bradenton, Fl and saw that there is a major effort underway to pump sand from the Gulf of Mexico up onto the beach to increase it’s width. I anticipate this will be one of the best beaches in the area soon. It was already very nice, but now the white sand will be even better than before. I like to take pictures of these tropical seascapes to use as a basis for my paintings. The wild cumulus cloud formations from tropical storms are amazing every night at sunset. The summers sunsets here in Florida have an amazing array of color and cloud formations, so there is never a lack of inspiration. We have just about sold out of the Large version of this Giclee and I need to provide something new for people want something similar. I REALLY like the way it’s coming together. I think it will be one of my most popular pieces. I’ll take some photos during the process and post them at a later date. Take a look at my newest Original Surfboard Painting. I really like how these are turning out. My ocean seascapes have been changing over the years as I try different techniques and paint varying types of waves. These night scenes are particularly eye catching paintings with the vibrant blues and heavy contrast. If you like this, you can see it soon at the Adam Scott Rote Gallery in Key West, Florida. I’m having it photographed this week and I’ll ship it down after that. This window painting has been flying out of the gallery in Key West. Only problem with that, is I now need to paint a gorgeous window to replace it. This is such a popular window painting that I don’t want to deviate from the general look and feel of “A Beautiful Day. It will obviously be a completely new painting, just along the same general seascape ocean painting theme. If you still want “A Beautiful Day” don’t worry, you can still get the regular size version until those sell out! 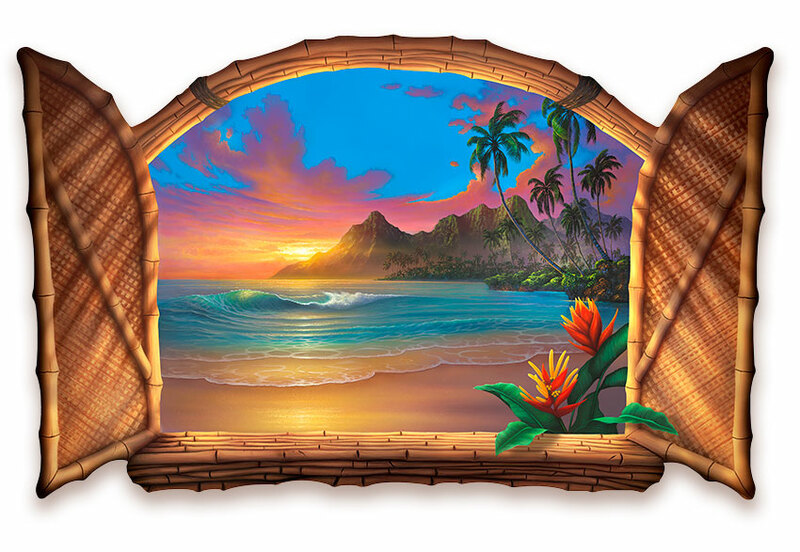 It’s 31″ x 48″, so you can still cover some wall space with this Window to Paradise! 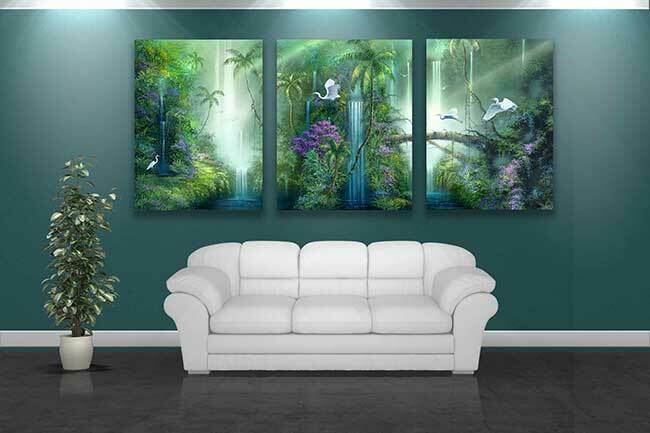 Take a look at the options that are available for high quality peel and stick murals as well as posters that are first quality reproductions of my paintings. There are many to choose from and you are buying directly from me! New Original – Natures Autumn Glow – Sold! The show in Key West was a wonderful success this weekend! We sold several pieces of art as expected and really got a feel for the beautiful Adam Scott Rote Gallery and it’s staff. What a great bunch of folks down there. This gallery is not only a beautiful presentation of fine art, it is a quiet, zero pressure atmosphere to look and admire while you shop for your newest fine art acquisition. We sold one of my newest original paintings – “Natures Autumn Glow”. I’m really proud of the piece and I’m thinking about offering it as a limited edition giclée. 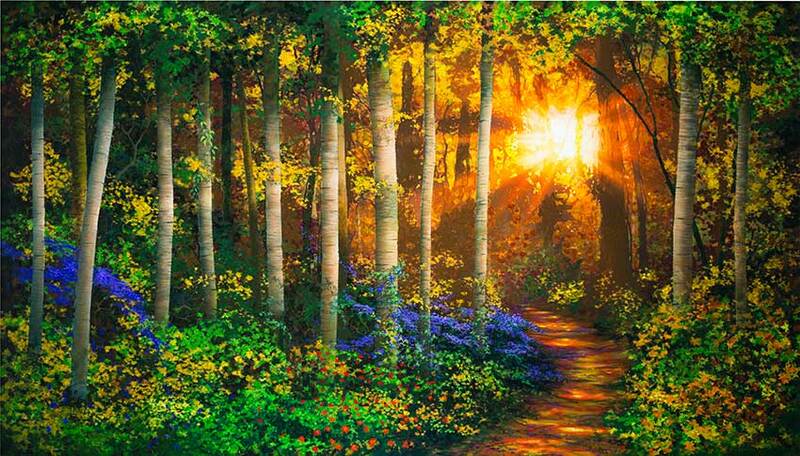 It really takes you into the forest in it’s dimension and vibrant colors of autumn. These “woods” pieces have been very well received at the galleries. They seem to sell within days of arriving and I really need to paint more of them to keep up with demand. I’ve been a bit distracted lately by an invention that will be in production shortly. I’ll blog about that a little more as I get closer to landing it in retail outlets. So I’m exited about the progress on these new surfboard paintings. I have two done. One sold, the other is getting ready to ship to Key West (Adam Scott Rote Gallery). I also have one in the works and two more being prepped for paint. I like the canvas to be as smooth as possible before I set a brush to it. It allows me to add intricate detail without distortion due to the ridges in the canvas. Oh, by the way, I have completely repainted one of my Windows. If you look on the windows tab of the website you will see one called “No Worries”. http://www.mauiarts.com/Gallery%202009/Tree-House-Painting-No-Worries.html I have created a new version of it. Not sure what to name it yet. Perhaps Paradise Hideaway? Reminds me of the Swiss Family Robinson. My version anyway. I think tree houses are the coolest things. Apparently a lot of other people do too, because they are popping up all over the world as unique travel destinations and accommodations. The perfect tree house would also be overlooking the ocean. Your own tree house seascape! I have had a busy day of painting. I started the new Seascape surfboard and messed it up post haste. Had to restart. That is frustrating, but part of the creative process I guess. When you are a perfectionist at heart, you can’t settle for ok. Most people wouldn’t really care or notice the things that bother me in my work. It has to be just right, or I just won’t publish it! As I mentioned Monday, I sold an original Surfboard at the Diamond Head Gallery on Maui this week. I am thinking of doing a series of these wild surf surfboards as my next endeavor. I have another one almost done (as you can see above) and a couple others primed and ready to start. By the way, these are not actual surfboards. Similar to my Windows to Paradise collection, they are cut from wood in the shape I design and then we stretch canvas over the shape to create the illusion. The process is a bit complicated. I design the shapes by hand and then transfer the images to the computer where I create digital cutting files. These are transferred to another computer that controls a CNC router since we cut them on a CNC router (computer controlled). I’m wondering if I should create a line of surfboard giclee’s? I’m selling two of these at several galleries and they’ve been doing well. “Island surf” http://www.mauiarts.com/Gallery%202009/Beach%20Painting_Island%20Surf.html is more in line with my typical seascape painting. Calm tropical waters, blue sky and waves lapping the beach. I’m always coming up with something new, so check back tomorrow for an update on my progress with these new original surfboards. I may post a pic of the one I’m completing today. I think this one will be sent to Hawaii as well. As I finish more, I’ll distribute them to galleries in Key West and Coronado, California. Oh yeah, I almost forgot. I sold the first of “Neptune’s Garden” yesterday. 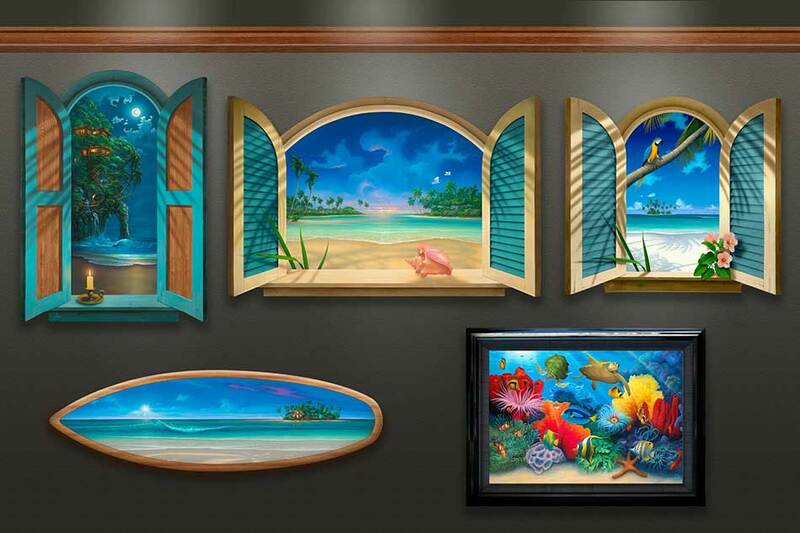 http://www.mauiarts.com/images/Neptunes_Garden_Dolphin-Painting.jpg The collectors were thrilled with it. They picked it up here at our studio in Bradenton, FL. For local collectors or those traveling through Florida, we are always happy to meet with them personally and have them pick up their art at the studio. Keep that in mind if you are ever in Florida! 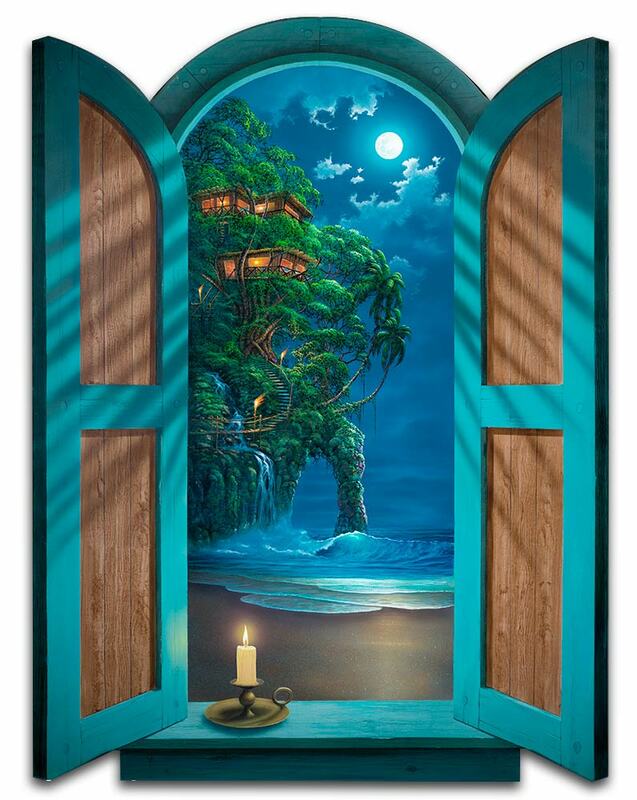 “Beyond Paradise” is my most recent addition to the Windows to Paradise collection. The collection has well over 20 distinct Window images now. This is the 5th in the Polynesian Bamboo style. I’ve not done a sunset yet, so this is very unique in the collection. I’ve always been drawn to sunsets and seascapes, so this piece is a favorite of mine. It is available in two sizes (regular and large). The original is showing at the Diamond Head Gallery in Lahaina, Maui. Please stop by and take a look if you make it over the Hawaii anytime soon. They are also showing a limited edition giclee so you can see for yourself how accurately and vibrantly these reproductions are.